The all new Solo s1100 in the Solstice Series of LED off road lamps. Equipped with Vision’s brand new 10 watt LED technology, with each 10 watt Solo producing 900 lumens making them the brightest LED off road lamp on the market in only a 2” x 2” square housing. Not only are they the brightest, they are the most efficient with the s1100 drawing only 0.75 amps due to their advanced electronic drivers which are also responsible for their 50,000 hour life span and variable 9 - 50 Volt DC input. The Solstice Solo’s main feature is the 4 sided channel design that allows you to interlink it on all four sides with another Solstice Solo pod or other various available mounting hardware for flat, tube or even helmet mount making it the only modular light with the ability to make any shape or length with the available spot, euro and flood beam patterns mixed throughout your custom configuration. No power on your ride, no worries; Vision X will also be releasing a line of rechargeable battery packs for any configuration of your Solstice Solo light pods. 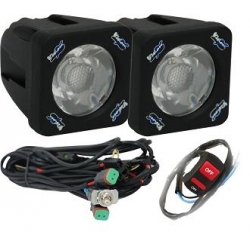 This kit comes with 2-Solstice Solo Squared Lights with your choice of Beam Patterns, 1-Dual Harness to easily plug-n-play both lights to motorcycle and battery, and 1-Handlebar mounted rocker switch. If you have a motorcycle that needs a different switch, contact us and we will supply a different switch for you.